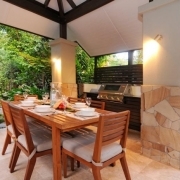 We found no accommodation in the Port Douglas Resorts category that will suit your group. Resorts are what turns an ordinary holiday into an ultimate destination for relaxation; enjoy the added convenience of having all that you need in one spot, when you need it. No dishes, no cooking or cleaning as all is taken care of within the resort. The only thing you need to concern yourself with is, do you go back to the breakfast bar for a second helping of the buffet and when does the swim up pool bar open? Ahh...this is the life, the perfect opportunity to get away from it all, and being in the tropics only enhances that laid back experience. 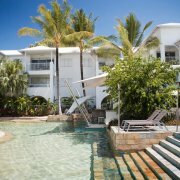 QT Resort Port Douglas is an oasis of relaxation. Walk in and you will be welcomed by a fresh open-spaced reception with contemporary designer, yet quirky, tropical furnishings. Featuring everything you need to relax and unwind, guest facilities include a large lagoon-style pool, swim up bar, al fresco dining day and night, day spa, fully equipped fitness room, super-cute retro QT bikes, tennis courts, room service, moonlight cinema and a modern resort lounge bar where you can chill out and listen to some grooves in one of the luxurious outdoor booths. Guest rooms and holiday apartments all have custom designer features for an unforgettable holiday experience. Boasting luxurious QT king beds, balconies, bespoke bathrooms, deluxe amenities, iPod dock, 42 inch flat screen and bespoke designer furnishings. In addition the One and Two Bedroom Villas feature modern kitchenette facilities should you prefer to self cater. The Bazaar Marketplace is the signature restaurant and heart of QT Resort Port Douglas, showcasing an international mosaic of foods. Bazaar chefs provide a theatrical and thoroughly interactive dining experience to create both an ocular and gastronomic experience for guests. 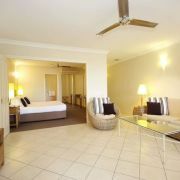 Only a short drive to Macrossan St, QT Resort is the ultimate destination for relaxation in super cool, chic surrounds. 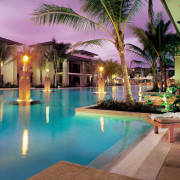 Sparkling blue lagoons and tropical landscaped gardens will greet you at the Sheraton Mirage Port Douglas Resort. This 4 star resort is situated directly on Four Mile Beach, renowned for its 130 hectares of lush gardens, 2 hectares of magnificent swimmable saltwater lagoons, a championship 18-hole golf course, award winning dining and international cusine at its finest; you will experience the best of upmarket resort living here, in space and style. Resort rooms feature either a king or two double beds, spacious living areas, marble bathrooms and views of either lush tropical gardens, the landscaped golf course or sparkling lagoons. 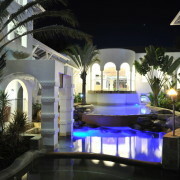 Whilst the uniquely furnished Villas are designed for longer stays with friends and family. One thing is for sure at the Sheraton Mirage, you will never go hungry! The Lagoons Restaurant is the perfect place to start your day with a hearty buffet breakfast, all freshly chef prepared with eggs to your liking. No need to leave your sun lounge, enjoy lunch or a snack by the lagoon. High Tea is available daily with a selection of sweet and savoury items served in a traditional high tea tower. Experience elegant fine dining at Il Pescatore and select from a creative menu complemented by the finest cellar wines. The Sheraton also makes for a fun filled family holiday. The kids are sure to make the most of the two hectares of sparkling swimming pools. Aqua Play is held in the North Lagoon every Monday, Wednesday & Friday for family fun on a floating obstacle course. Perfect for all ages, join in the jumping, sliding, bouncing! The Kidz Club operates throughout all Australian School Holidays and is available for children aged 4 to 12 years. Activities include pool games, arts & crafts, sandcastle competitions, puzzles & games, painting, jewellery making, DVD's, ball games and painting classes that can be a little bit messy but a whole lot of fun! There is also an activities room with video game arcade for more action. The Sheraton Mirage Port Douglas offers direct beach access so once you're done in the pool head over to the sands of Four Mile Beach and lap up the tropical beauty of Port Douglas. 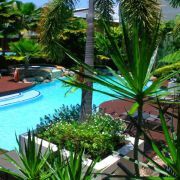 Rendezvous Reef Resort is a full-service resort offering, in addition, the freedom and flexibility of self-catered accommodation. Set amongst 15 acres of lush tropical gardens,the resort features affordable one, two and three bedroom self-contained villas that are ideal for families. The townhouses are 2 storey and include all your standard features of a typical holiday apartment with a lounge and dining area, fully equipped kitchen, separate laundry, and a balcony or patio. The are plenty of ways to enjoy your days at Rendezvous Reef Resort, with two lagoon-style pools, a leisure pool plus 25m lap pool, gymnasium, barbeque facilities and free internet access. The sylish Straits Cafe and Swish Bar is located next to the pool and is handy for those days when you just don't want to cook. Enjoy hearty breakfasts, delicious dinners, happy hour drinks and everything else in between. Conveniently a full breakfast is included daily in the room rate for 2 adults and 2 children under 12 years. The resort is located about a 5 minute drive from Macrossan Street, there are regular shuttle buses that operate into the village centre if you do not have your own car. The Portsea is a boutique resort featuring hotel rooms and one and two-bedroom studio apartments. 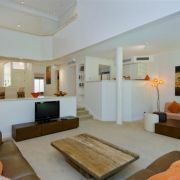 Apartments include the additional comforts of kitchenettes, spa baths and balconies with garden or lagoon pool views. 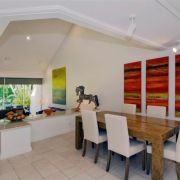 Conveniently located just 800m to Macrossan Street and 150m to Four Mile Beach, The Portsea Resort is ideal for those who want the best of both self catering and resort living, with the added bonus of being close to all the amenities in Port Douglas. Fresh, stylish furnishings compliment the Mediterranean theme to this resort. Popular with couples and families, there is a toddler's pool, 2 spas, a water slide and waterfalls as well as the main lagoon with a carved crocodile feature and swim up pool bar serving drinks and snacks throughout the day. 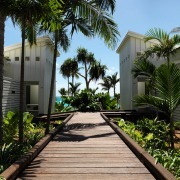 A footpath is located alongside the property giving direct access to Four Mile Beach. Whether you are busy out exploring the region or choosing to relax by the pool, The Portsea Resort has a laid back unhurried atmosphere perfect for a tropical escape and welcoming after a day of adventures.